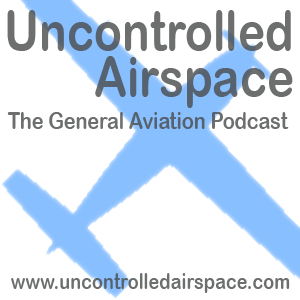 For those of you out there producing your own podcasts, or for the just plain curious, here are some notes on the process, equipment, and software that we use to create each episode of Uncontrolled Airspace. We do a new episode of the podcast each week. Throughout the week, between eps, the three of us, along with that week's guest if we're having one, will exchange lots of emails about what the interesting stories of the week are. We have a private webpage where we list these ideas, and we refer to that page during the actual recording. It's important to note though, that we all agree that any story/subject is fair game, not just one's on the list. We usually record the podcast on Thursday morning. We do it as a Skype conference call. All-in-all Skype is a wonderful tool. It makes this sort of roundtable session possible without spending big bucks. And the sound quality is excellent. Having said that, we do occasionally struggle with the Skype connection. We're still trying to understand, and predict, the factors at play here, but it seems to be pretty important to have as little as possible running on all the computers (especially things that run in the background, like mail apps, and things that use lots of RAM), and to maximize the quality of the internet connection (cable or fast DSL, not dialup... hardwired, not wireless). Also, the computer which hosts the Skype conference call is the most critical for having good bandwidth, being fast, and having little else running. Jeb and Dave run Skype on Windows machines. Laptops I believe. They each have cable internet connections. Jeb is usually hardwired to the net, Dave occasionally is on wireless. Both Jeb and Dave have audio headsets which they use for the podcast. Jack is the Skype conference call "host". He runs it on his dual core MacBook laptop. The call is recorded with the elegantly simple Skype plug-in "Call Recorder". This tool provides a simple, one-button utility for recording Skype calls. it produces a two-track recording with Jack on one track, and all the others on a second track. Ideally everyone in the call would be on their own track, but it doesn't do that (yet?) so we'll take what we can get. In addition to the Mac laptop, Jack has a desktop Mac as well. He keeps his notes for the show, runs the browser for realtime research, and plays the audio comments. The sound output for both the laptop and the desktop Macs are wired into a Alesis MultiMix 8 USB audio mixer. Also plugged into the mixer is a Heil PR-20 condenser microphone. Jack hears the live mix of the show through a pair of Apple branded headphone. An analog, "mix-minus" output from the mixer is fed back into the MacBook to be the input of Skype. The full output of the mixer is also sent, via USB, to the desktop Mac, and recorded, as a backup, in Audacity. When the record day arrives we get on the conference call. We spend a few minutes saying hi, and making some final plans for the episode. We try to not talk about actual aviation subjects during this time, we want to save that for the podcast. When the actual show begins, Jack starts a count-up timer which he uses to try and manage the overall length of the episode. In earlier episodes we would edit the listener audio comments into the show during post-production, but now we play them "live", through the mixer from the desktop Mac. When the recording is completed we usually chat for a bit longer, perhaps scheduling the next ep's recording time, then say our goodbyes. Almost all the post-production is done by Jack. The Call Recorder software produces a quicktime .mov file. That is opened in Quicktime player, and then converted to an aiff multi-track file. For some reason, Call Recorder generates four tracks, two identical pairs. The duplicate tracks are deleted. Then the extraneous conversation at the beginning and end of the recording are trimmed off. Then this "cropped" audio is exported as a two-track aiff file. This cropped file is run through the excellent Levelator utility which adjusts ("levels") the volume of the various voices in the recording. Levelator outputs an aiff file which is then imported back into Audacity. Jack listens through this audio, cleaning up any significant problems, noises, bloopers, etc. In general very little editing is done in this step. In the early episodes of the podcast, Jack did a lot of cleanup of things like umms and ahhs. But that got old real fast. We concluded that the time this took wasn't worth the little improvement it produced. Now most all the umms, ahhs, coughs, etc, are left in. While doing this editing pass of the audio, Jack writes the first draft of the show notes. He also identifies possible blurbs to be used in the show introduction. When this first pass is done, Jack writes the intro blurb for the episode, and finalizes the "title" for the ep. Jack then emails Dave, Jeb, and any other participants, a copy of the draft shownotes for review. Jack then begins to assemble the pieces of the show. Jack then records the show intro blurb, and drops that into the sequence. Next the theme music is imported and placed at the end of the blurb, and the main audio is positioned to begin toward the end of that music. Next Jack goes into his music collection, and into other music sources, searching for a piece of music to use as the closing tag. That music is imported and placed, and the closing "send your comments" voice-over is imported. Finally, the audio highlights are cleaned up and placed over the intro music. All the sound levels are fine-tuned, and then the completed show is exported as a mono aiff file. This aiff file is imported into Apple's iTunes, and immediately compressed into an mp3 file. Still in iTunes, the mp3 "meta-data" for the episode is added. The mp3 version is now exported from iTunes into a stand-alone audio file. Jack then opens this file with Quicktime player and spot checks the show to make sure none of the elements has gotten corrupted during the process, and checks for audio quality and volume levels. This mp3 file is uploaded to our hosting service, LibSyn. LibSyn, aka Liberated Syndication, is a hosting service which specializes in hosting audio and video podcasts, at very low prices. The show-notes are finalized and published to the website. The episode summary is added to the home page. Since the first eps of the podcast we've also used LibSyn's tools for creating and publishing the RSS feed for the show. As of April 2007 we are in the process of transitioning over to editing our feed with the very promising utility, Feeder, and publishing the feed through Feedburner. We're being pretty careful about this transition so that none of our subscribers is dropped, or inconvenienced, during the change-over. The updated RSS feed is published. And downloads begin almost immediately. Writing it all down like this makes it sound like a herculean task. But it's not as big as it sounds. In the early days it took quite a long time to do each ep, but over time much of it has fallen into a routine. It moves along pretty quickly.